When mechanical genius Emily is kidnapped by rogue automatons, Finley Jayne and her fellow misfits fear the worst. What’s left of their archenemy, The Machinist, hungers to be resurrected, and Emily must transplant his consciousness into one of his automatons—or forfeit her friends’ lives. With Griffin being mysteriously tormented by the Aether, the young duke’s sanity is close to the breaking point. Seeking help, Finley turns to Jack Dandy, but trusting the master criminal is as dangerous as controlling her dark side. When Jack kisses her, Finley must finally confront her true feelings for him…and for Griffin. Meanwhile, Sam is searching everywhere for Emily, from Whitechapel’s desolate alleyways to Mayfair’s elegant mansions. He would walk into hell for her, but the choice she must make will test them more than they could imagine. 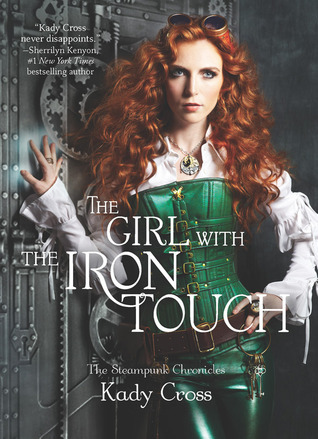 Worldbuilding: The world of The Girl with the Iron Touch has the same awesome historical London air, with steampunk and paranormal elements. It’s a lovely and well balanced mix. Characters: We meet Finley, Griffin, Emily, Sam, Jasper and Jack again. I loved them as dearly as ever, if not more this time. We also meet the Machinist again, not that we’d been missing him – and he’s the one villain I for sure never will like – and his automatons. We also meet Mila, a lovely young woman who I’m sure we’ll see more of soon. Or I hope, at least. I loved the way characters evolved, and I felt we finally got the emotional progress I’m sure we’ve all been rolling our eyes and snorting for: the romance. Both Finley and Griffin and Emily and Sam are faced with admitting and sharing their emotions, and hallelujah for that. I was starting to get annoyed with the suspense on that front, I mean things were just so obvious, I just kept screaming in my head “Come ooooon!” and “Bloody say it already! !” and such. Plot: Though still very active, filled with intrigue and action, I liked this novel more than others in the series because we FINALLY get our due on the romance front. I’ve been frustrated with the lack of progress on that front in previous books. Don’t get me wrong, I’m not saying there had to be romance, but if there is, don’t let leave hanging for too long, in God’s name have mercy on our hearts, lol! Writing: Third person narrative from more than one POV, mostly Finley’s, Emily’s and Mila’s (loved her the most xD). All the steampunk goodness is still in there, and the writing is, in my opinion, superb. Curb Appeal: Pffffft. Instant buy. All in all, I felt this was a marvelous addition to the series and enjoyed reading it terribly. If you’re into steampunk, I highly recommend giving this series a try. Loved it.